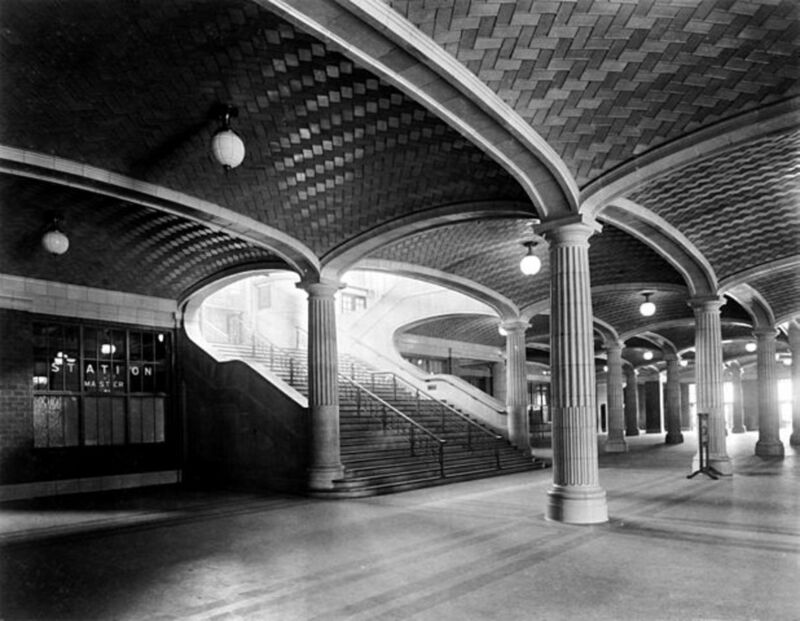 Architectural photo of Chicago's Union Station shortly after its competion in 1925. The phenomenal growth of Chicago in the late 19th and early 20th Centuries is tied directly to its role as the railroad hub of the nation and the innovation that it attracted. The first railroad made its way into Chicago in 1852, when the marshy outpost at the confluence of the Great Lakes and a water route to the Mississippi River had approximately 35,000 residents; just 28 years later, Chicago had more than half a million. In the decade from 1880 to 1890, Chicago more than doubled its population to nearly 1.1 million. From 1890 to 1930, the city tripled its population, reaching 3.3 million. Chicago’s ports and railroads brought manufacturing and jobs, drawing unprecedented hordes of people as industry and transportation fed off each other to create the most prolific boom town ever seen. 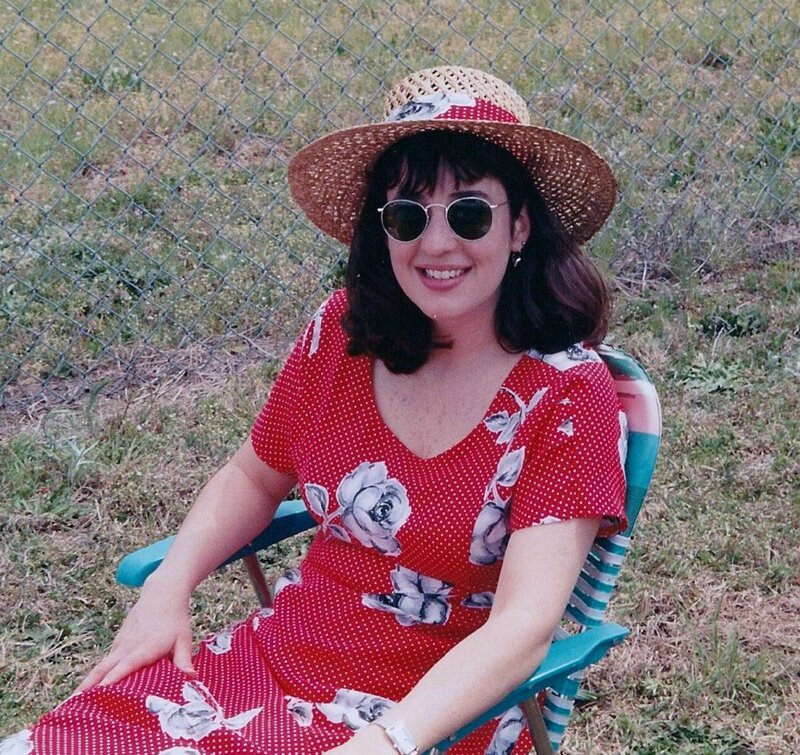 Cool lake breezes kept the city somewhat comfortable during summer days before the advent of air conditioning; a central location made the city attractive as a national business center and convention site prior to airline travel. Yet technology and costs change over time, and the enormous growth of Chicago from a small, marshy village to dynamic Midwestern megalopolis in only 80 years could not possibly be sustained. Even though Chicago made a successful transition from railroad to airline hub, other technological and social changes made its location less advantageous. 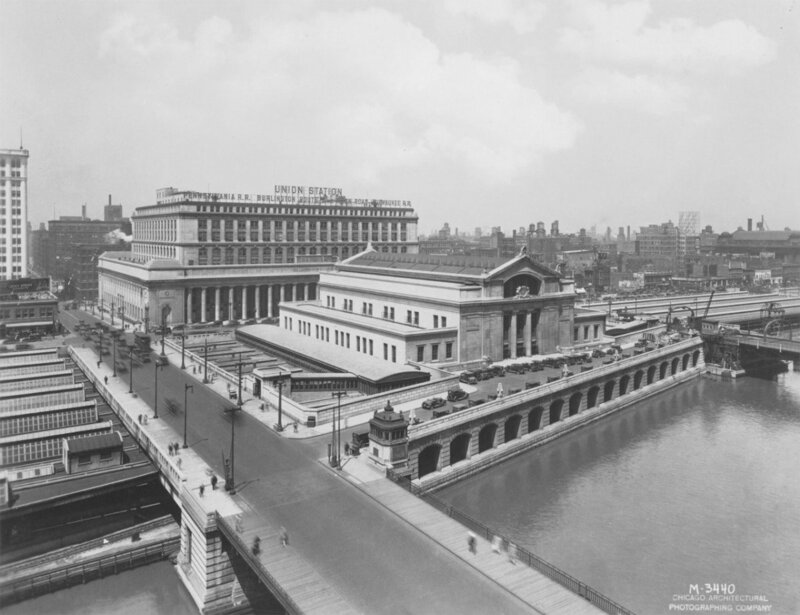 A look at the majestic passenger railroad stations in Chicago during the middle of the 20th Century gives an insight into the influence of changing technology and the evolving effect of transportation and culture on a city’s growth and prosperity. Dearborn Station is Chicago’s oldest existing train station, designed by architect Cyrus L. W. Eidlitz and opened in 1885. 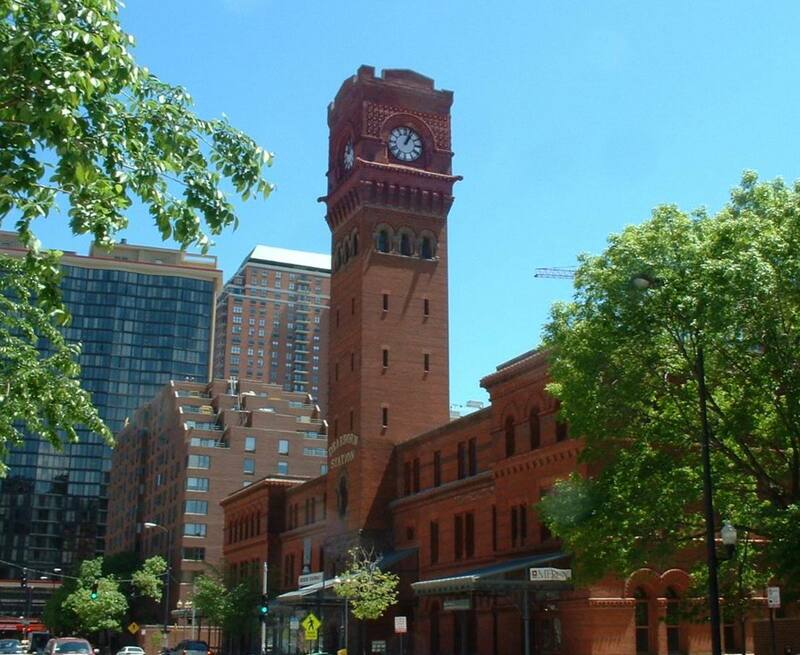 The original design featured a Flemish-influenced clock tower centered at the south end of Dearborn Street. 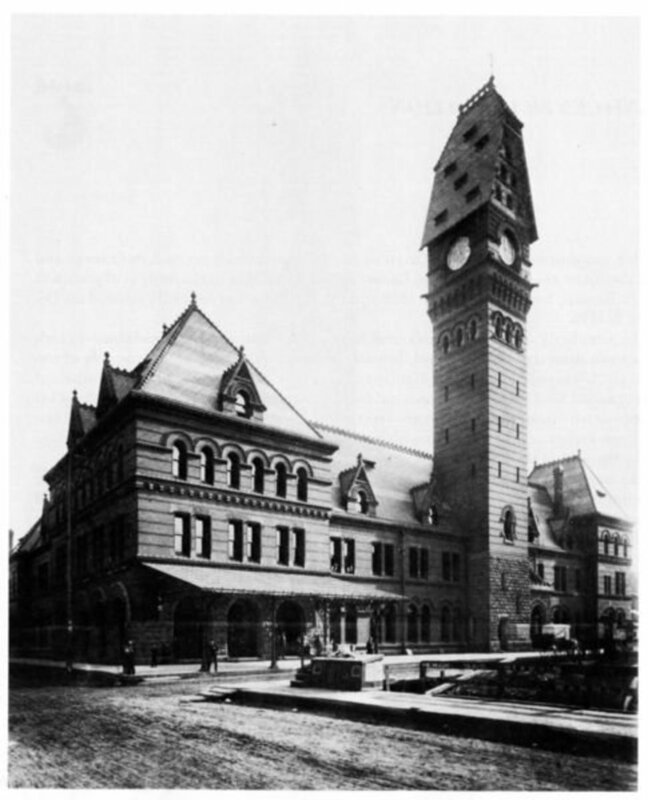 A 1922 fire destroyed the tower and the hipped roof of the station; they were replaced by a Romanesque design and a flat roof in 1923. Dearborn Station was built for the Chicago & Western Indiana Railroad at a cost of approximately $500,000. Soon after its opening, it became the Chicago terminal for the Atchison Topeka & Santa Fe Railroad. In 1899, the station was host to 25 railroad lines and 122 daily departures serving approximately 17,000 passengers per day—plus considerable freight business serving the nearby printing houses in Printer’s Row. As one of the foremost railroad travel gateways to the American West, Dearborn Station remained especially vital until the 1960s. 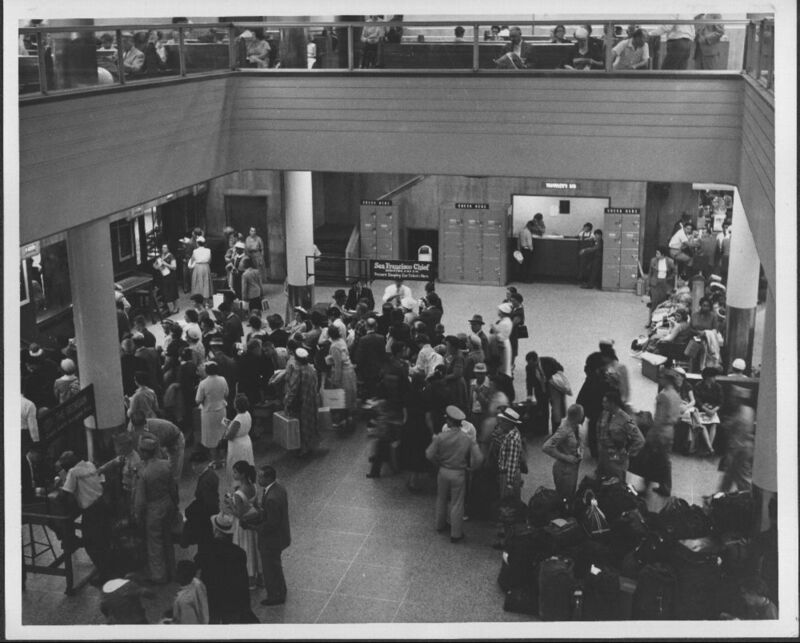 When Santa Fe handed over passenger service Amtrak on May 1, 1971, departures and arrivals were moved to Union Station. 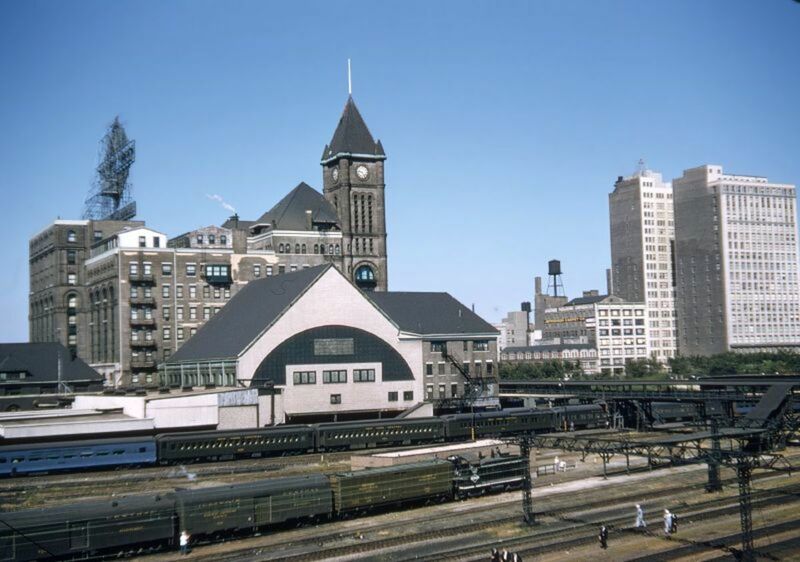 The distinctive and irreplaceable Dearborn Station was placed on the National Register of Historic Places on March 26, 1976, just as its acres of approach tracks and the giant train shed was demolished to make way for a new concept in urban renewal. Dearborn Park’s landscaped mixture of townhouses, mid rises, and high rises were the result of a master plan created Skidmore, Owings and Merrill. The station itself was transformed into a shopping galleria and offices with 120,000 square feet of leasable space, helping the historic station survive the economic pressures that resulted in the destruction of Chicago’s other railroad palaces. Architectural photo of Grand Central Station, circa 1900. Main entrance of Grand Central Station beneath 247-foot clock tower at the corner of Harrison and Wells. The Corinthian columns and magnificent interior of the Grand Central Station, circa 1966. Grand Central Station, circa 1968. According to many railroad and architectural historians, Chicago’s Grand Central Station was the most elegant of the city’s six mid-20th Century railroad stations. Built in 1890 and designed by Solon S. Beman—the architect behind many great Chicago buildings and the company town in the historic Pullman District—Grand Central Station was an ill-fated masterpiece. 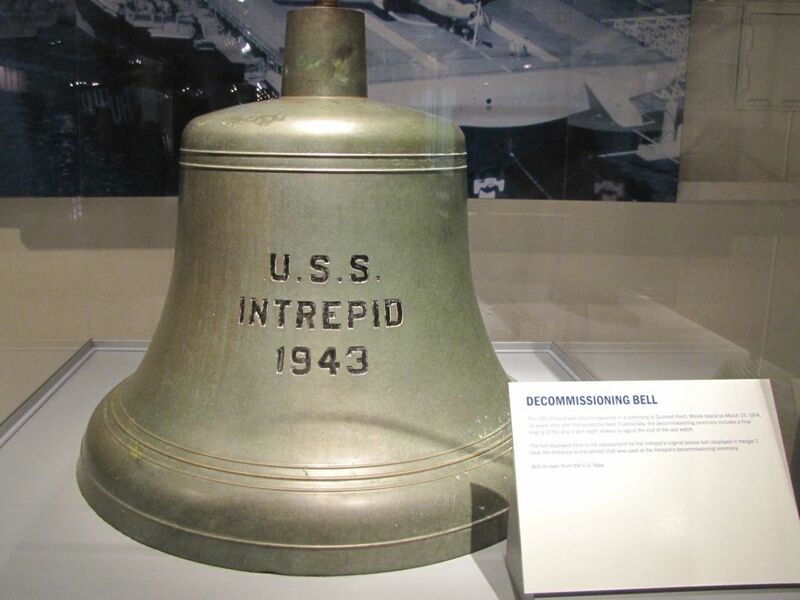 The station’s most prominent feature was its 247-foot clock tower with an 11,000 pound bell that peeled off the hours. 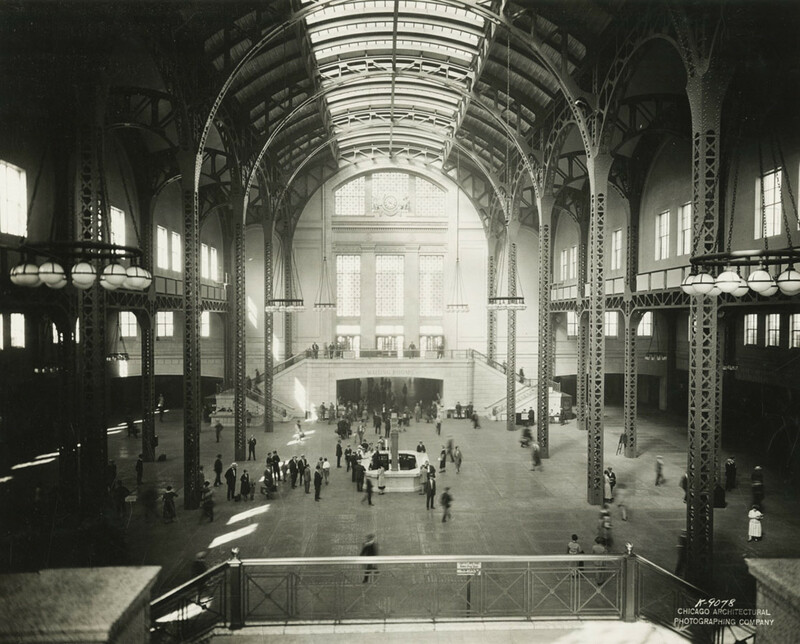 Located only two blocks from the Board of Trade and the Central Business District, Grand Central Station was centrally located between all the other passenger train stations in the city, making transfers to other railroads easier. Inside its graceful arched doorways and stained glass windows was an ornate waiting room with gold-leaf Corinthian columns, marble floors and a marble fireplace. 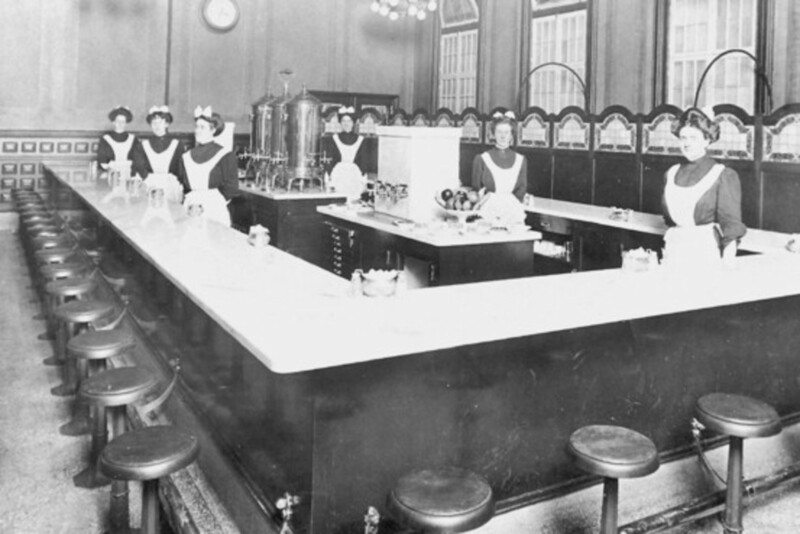 In its early days, the station contained a 100-room hotel and a high-end restaurant. Grand Central’s beauty and superior location never compensated for the unfortunate timing and economic problems of its owners. The first station owner, the Chicago and Northern Pacific Railroad, went bankrupt in the Panic of 1893 and the Depression that followed. In 1910 the Baltimore & Ohio Railroad bought the station, but unlike the other train stations in the city, B&O did not operate a commuter service to the suburbs, hampering its economic viability. By the late 1960s, Grand Central Station was handling far fewer passengers than any other station in Chicago, averaging only 210 passengers per day when it closed in 1969. The station was demolished in 1971, and it was assumed that its prime location would fetch a high price for a commercial client as the city was enjoying a high rise building boom. Yet the Grand Central site has remained vacant ever since. The only hints that remain of the site’s former role are two concrete train boarding platforms, a portion of the foundation, and part of the passenger drop off driveway. 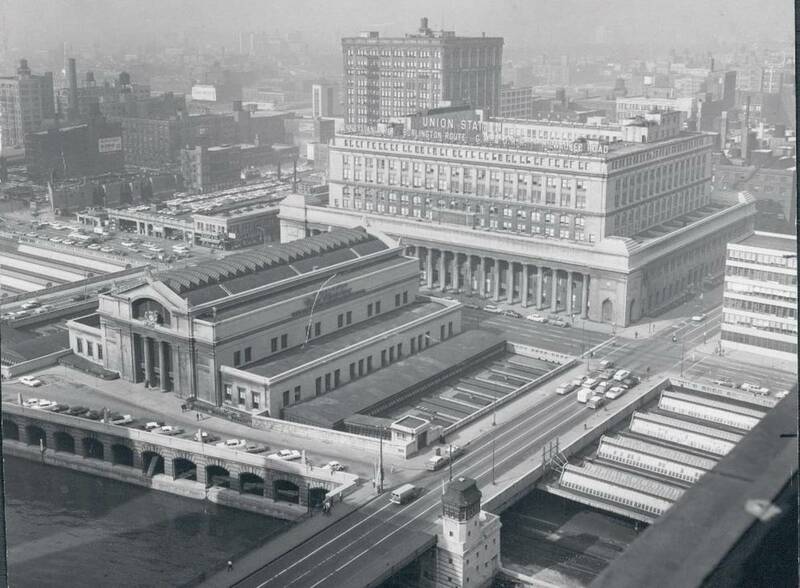 Illinois Central Station in 1955 as seen from The Field Museum. In anticipation of the World’s Columbian Exposition of 1893, the Illinois Central Railroad built a grand depot where the railroad’s lakeshore tracks met Michigan Avenue, just north of 12th Street (Roosevelt Road). 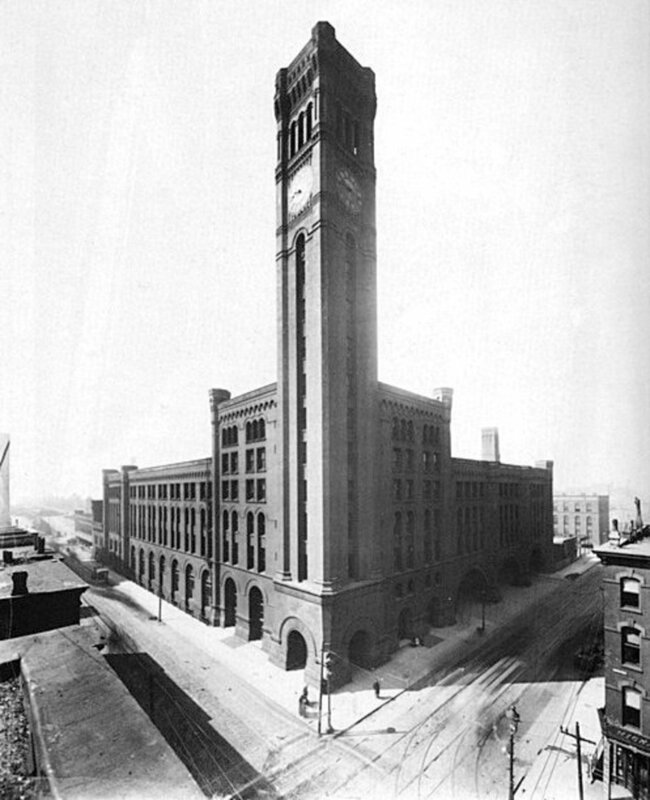 Designed by New York architect Bradford Gilbert, Illinois Central Station featured a nine-story office building with a 13-story, 225-foot clock tower. An enormous 600-foot train shed overlooked Lake Michigan before landfill built Grant Park and the Museum Campus out into the lake. The Illinois Central tracks continued north to its rail yard and freight warehouses at the Chicago River, built on wood pilings that hugged the original shoreline. The Illinois Central Railroad connected Chicago to the South. The station was a vital lifeline for African-Americans arriving Chicago during The Great Migration; Louis Armstrong stepped off a train at the station arriving from New Orleans on August 9, 1922. The Illinois Central's City of New Orleans-- a 934-mile route through Mississippi, Memphis, and Southern Illinois-- was popularized in a 1970 song by Chicagoan Steve Goodman and made into a hit in 1972 by Arlo Guthrie. As late as 1952, 19 daily long-distance trains—plus significant commuter service to the South Suburbs and Northwest Indiana—still departed out of Illinois Central Station each day. 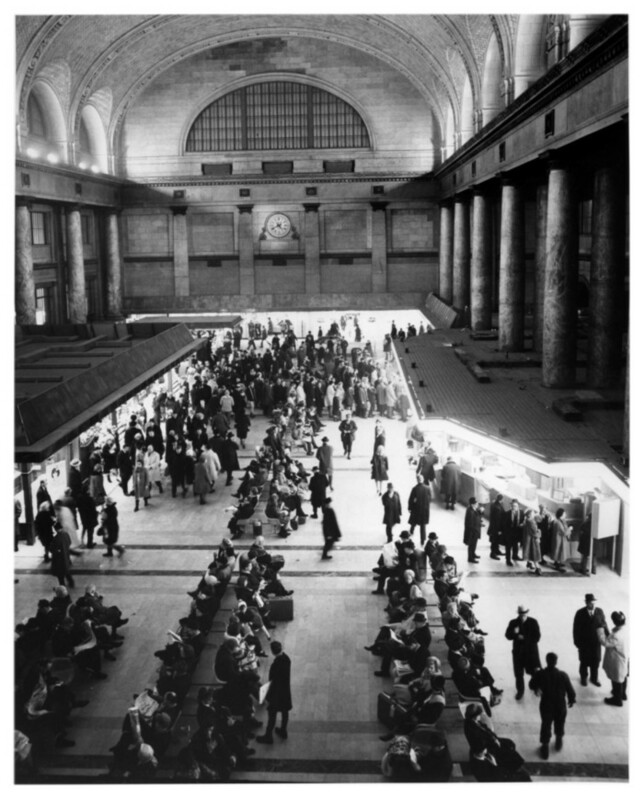 Even with the decline of railroad passenger travel, there were 11 daily departures from Central Station in 1962. The station survived even as Amtrak took over nearly all domestic long distance railroad passenger service on May 1, 1971, servicing the City of New Orleans, James Whitcomb Riley, Shawnee, Illini and Campus trains until March 6, 1972. 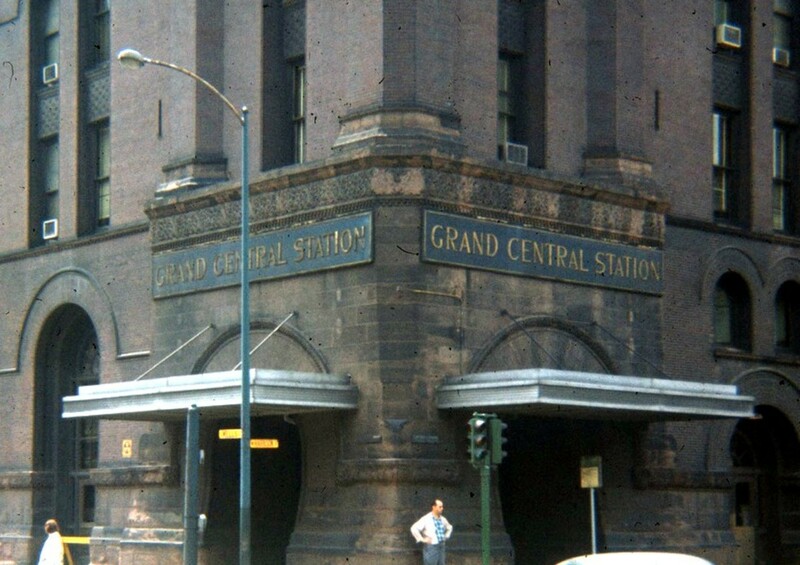 The corporate offices of the Illinois Central’s freight operations remained at Central Station until 1973, when operations were moved to new facilities at Two Illinois Center, and the venerable station at the southwest corner of Grant Park was demolished in 1974. 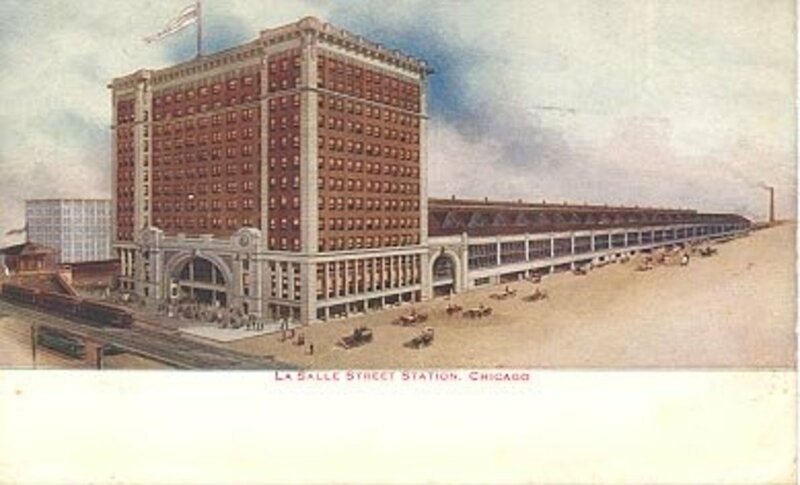 Postcard of LaSalle Street Station, circa 1910. 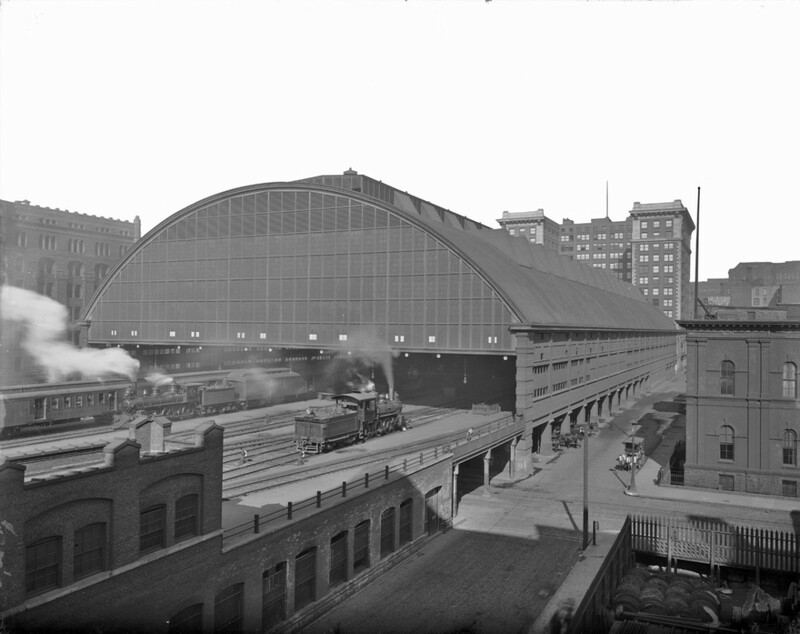 LaSalle Street Station train shed, 1905. 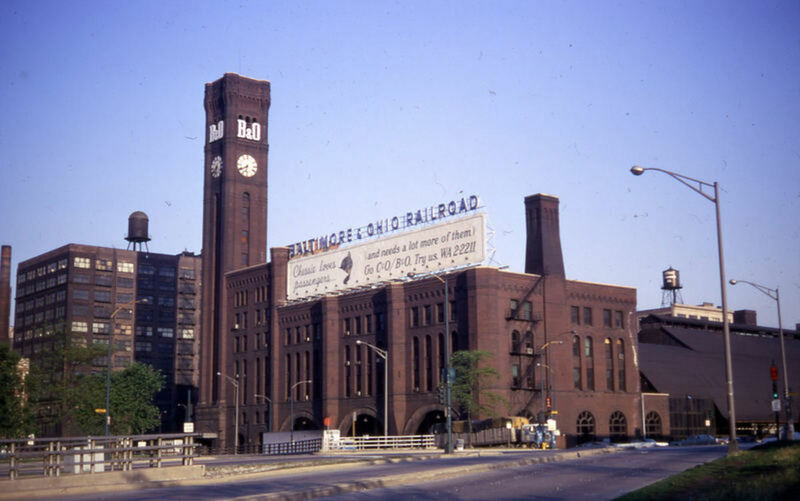 Chicago’s first railroad terminal was opened on May 22, 1852 at LaSalle and Van Buren Streets, and a railroad station has been at the site for 160 continuous years since. In December 1866, an attractive state-of-the-art station opened on the site; it would be rebuilt in a similar style following the Great Chicago Fire of 1871. In 1902, the New York Central Railroad’s popular 20th Century Limited began service to Chicago, and a new, modern station was built on the site. The LaSalle Street Station opened in 1903 with a station situated beneath a 12-story office building connected directly to the Loop elevated structure; it was across the street from the Chicago Board of Trade, and only a block and a half from Chicago’s financial district on LaSalle Street. The 20th Century Limited service thrived through the middle of the century until air travel supplanted the railroads; it ended in 1967. A year later, the Rock Island-Southern Pacific’s Golden State Limited to the West Coast ended service. A lengthy clip of the interior and train platform was featured in Alfred Hitchcock's 1959 thriller, North By Northwest. Most intercity rail service at La Salle Street Station ended on May 1, 1971 when Amtrak consolidated long-distance passenger rail services at Union Station. The Rock Island Railroad was one of the few passenger railroads that opted out of Amtrak; they continued to operate intercity service to Western Illinois from LaSalle until 1978. The station was demolished and replaced by a modern skyscraper in 1981, but the replacement station continues to serve commuter rail passengers between Chicago and the Southwest suburbs. 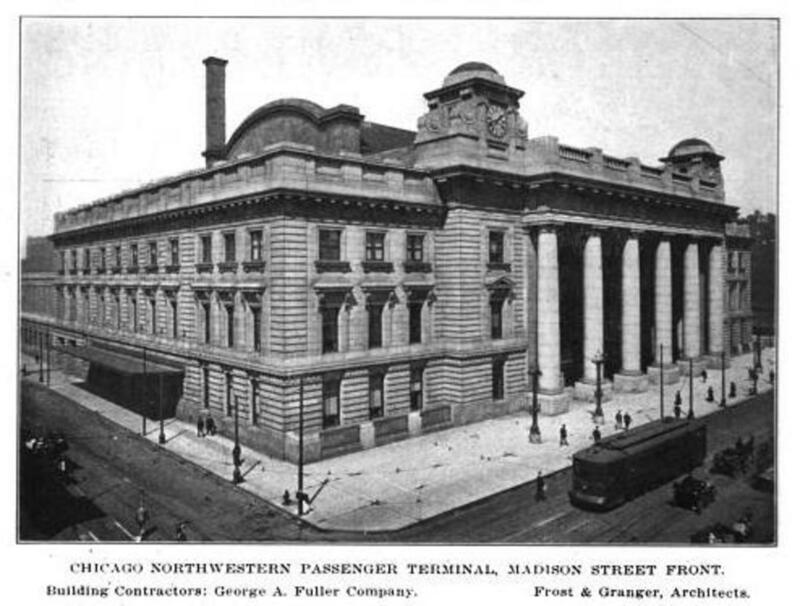 Architectural photo of the Chicago & Northwestern Terminal, circa 1913. 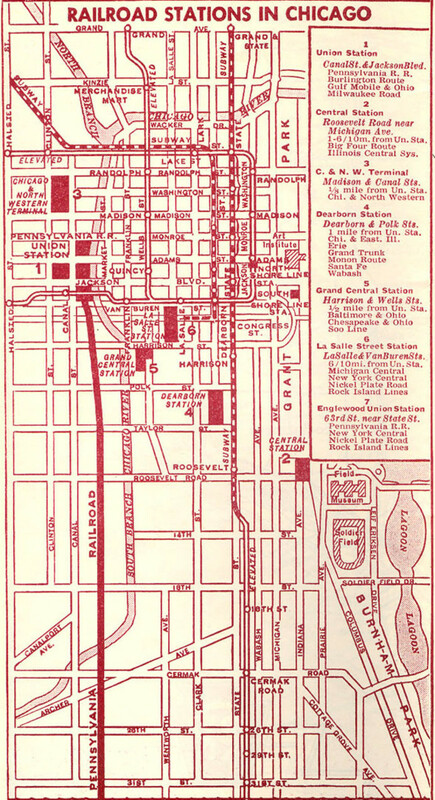 In 1911, the Chicago and North Western Railroad relocated their passenger station from Kinzie and Wells Streets (on the current site of the Merchandise Mart) to the West Loop. The regal Renaissance Revival station was designed by architects Frost and Granger, who also designed the 1903 LaSalle Street Station. 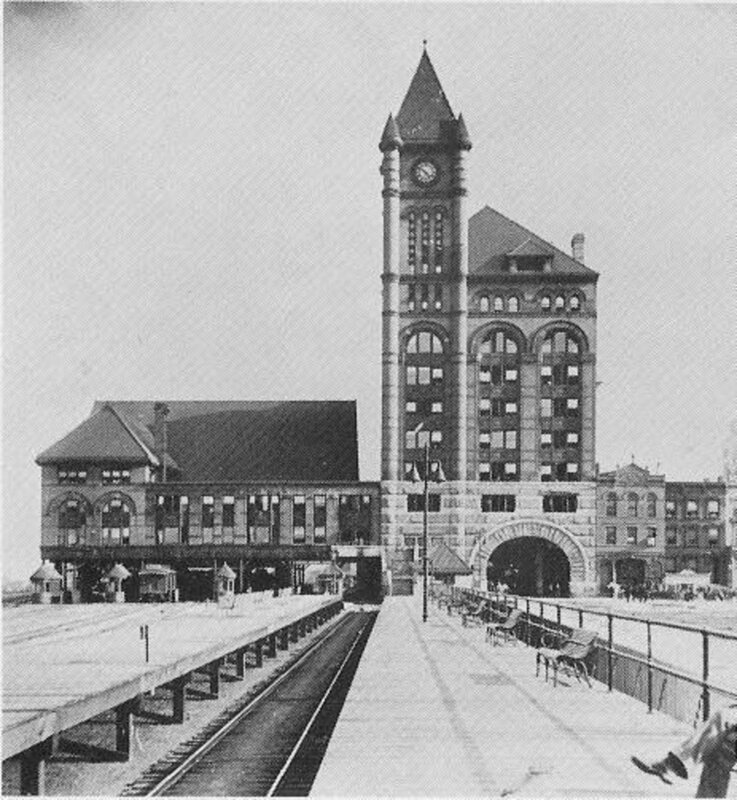 The exceptionally-busy commuter rail station also served long distance passengers to Milwaukee, Minneapolis, Madison, and many other cities in the upper Midwest. Construction of the station represented a monumental engineering task. Sixteen tracks were elevated above street level and covered by an 894-foot-long train shed. The upper level was featured a barrel-vaulted ceiling measuring 102 by 202 feet, and rising 84 feet to the roof. A street-level concourse served the tens of thousands of daily commuters to the North and Northwest suburbs. In 1969, the station ended long distance railroad passenger service. Carriers at Union Station took over passenger service to Wisconsin, Minnesota, and points west. 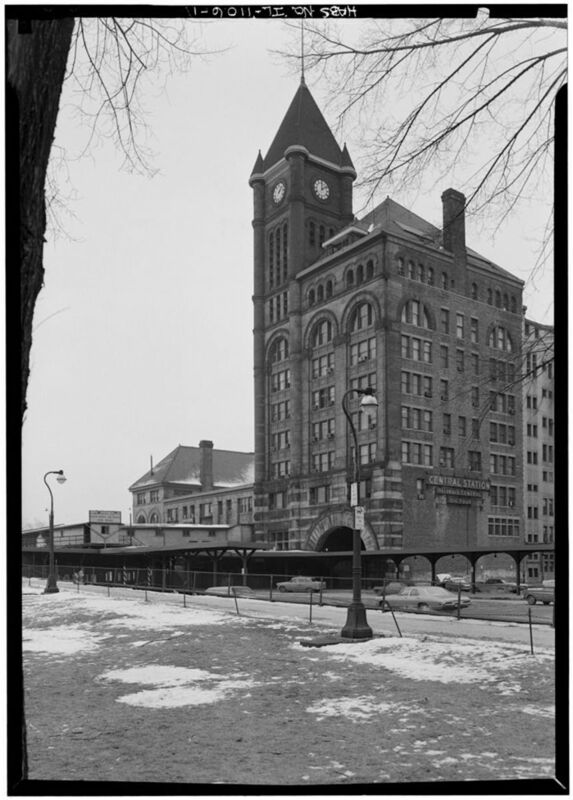 In 1984, the majestic headhouse was demolished and replaced by a 42-story modern glass office building, but commuter service to the suburbs continued during construction. Today the facility is known as the Ogilvie Transportation Center, and is the second-busiest among the four remaining commuter rail terminals in Chicago. 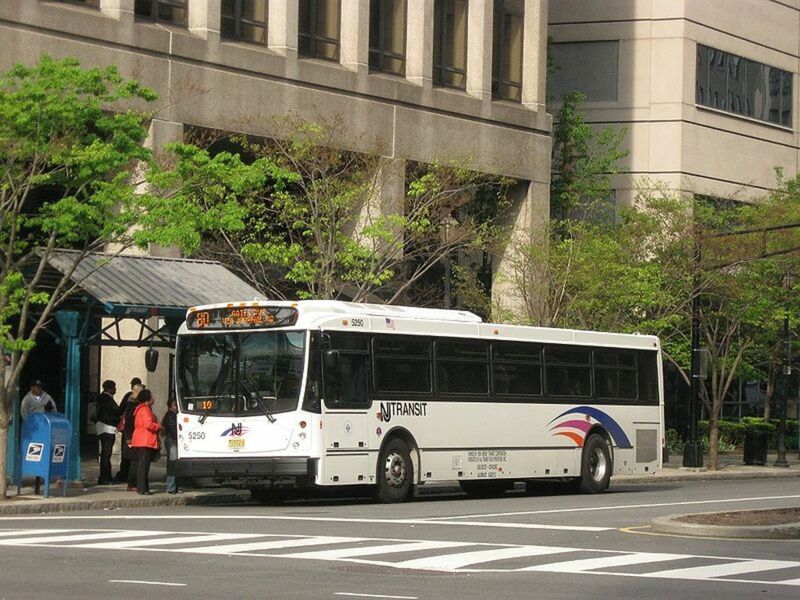 An average of 37,500 commuters use the facility during a typical weekday. 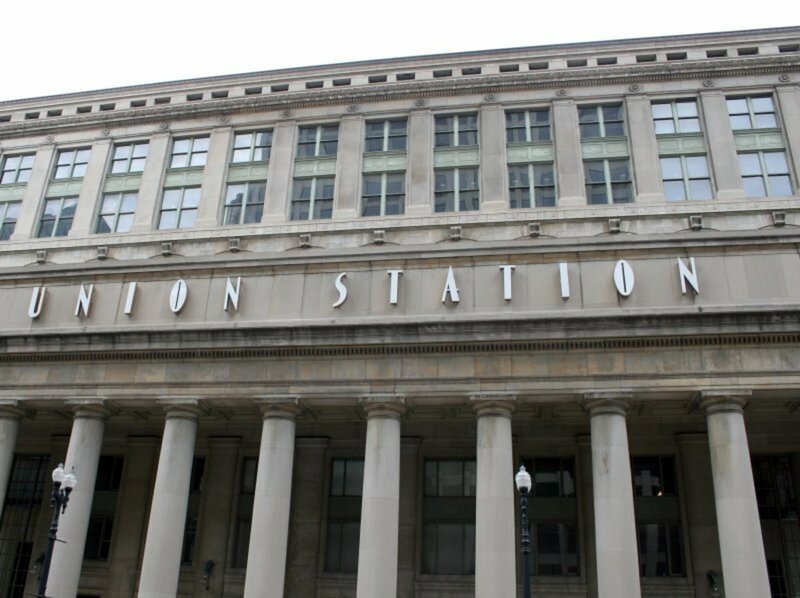 Chicago’s Union Station is the major railroad facility in Chicago and the only remaining intercity rail terminal. Built from 1913 to 1925 (interrupted by World War I and labor shortages), it occupies a site immediately south of a former station by the same name that operated from 1881 to 1925. Originally designed by Chicago’s prolific architect and planner Daniel Burnham, it was completed under the guidance of the firm of Graham, Anderson, Probst and White. In his 1909 Plan of Chicago, Burnham called for a large, majestic, centralized railroad station to consolidate railroad operations at a facility that could handle the kind of train travel volume scattered among several stations. A centralized location and transfer point would eliminate much of the redundancy and transfer difficulties that were knotting up downtown Chicago street traffic and re-orient development in a more efficient manner. Cooperation from individual railroad companies in relocating their freight and track facilities allowed for the Union Station location to serve that end. 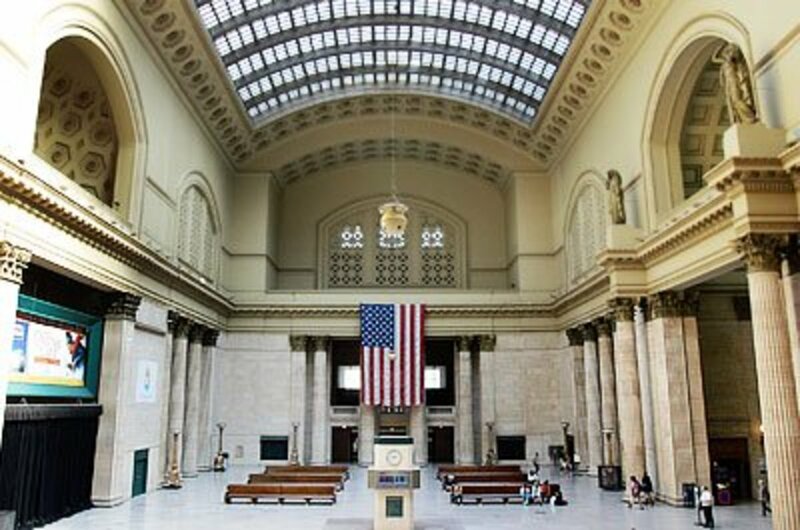 Chicago’s Union Station is an ornate Beaux-Arts masterpiece, featuring a main waiting room partially illuminated by skylights, a Great Hall, and elaborate underground passages to drop-off drives and a large, open concourse situated along the river. Union Station’s light, airy main concourse featured massive steel arches and multiple stairways providing access from street level. Click here to see a 16-page booklet from 1955 on Union Station and its amenities, with pictures and maps (PDF). The precipitous decline of railroad travel in the 1960s, the large amount of prime land taken up by the enormous station, and the model provided in New York City by the selling of air rights over Pennsylvania Station sparked a similar reaction in Chicago. The enormous grand concourse was demolished in the 1960s and replaced by a large office building. Waiting and boarding areas for trains were relegated to a cramped basement that at the time seemed adequate enough for the rapidly declining numbers of intercity railroad passengers. Yet since the late 1990s, rail travel has rebounded to levels not seen since the ridership curve was going in the other direction in the 1960s. 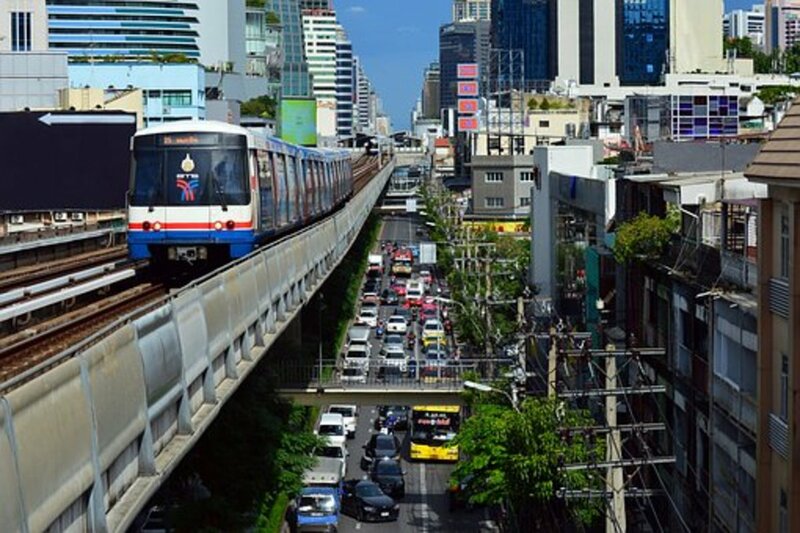 High gas prices, heavy automobile traffic, increases in parking fees, improved rail service, state subsidies, and a revitalization of connecting inner cities have contributed to the attractiveness of rail travel. Today, Union Station is far beyond its designed capacity. More than 120,000 people use Union Station daily, including approximately 10,000 Amtrak passengers who wait in boarding lines that often stretch out into passageways. The resurgence in rail travel over the past decade is a result of cost factors, convenience, state and federal subsidies, technology, an aging population, and the enormous capital expense of adding additional capacity to highways. Millions of passengers have been prompted to look to the past for affordable and convenient alternatives to intercity travel, and many have opted for rail. It would be a lot easier for many others to adopt rail as a viable mode of travel if it hadn’t been for disinvestment and destruction of railroad infrastructure that was mindlessly frittered away because of a temporarily unfavorable mix of energy and infrastructure costs. If a similar investment can be made into railroads, there’s no reason they can’t compete with highways as a viable, efficient, and convenient mode of travel. A very interesting and informative hub. Growing up in Chicago and using the BN line (now BNSF) many times Union Station was my favorite, but Madison Street Station (CNW), was a close second. Thanks for the memories. Come over and read my hub on BN commuter service, which used the south end of Union Station, long wih PRR, GM&O and Amtrak. Thanks, rfmoran! Any one of the six stations covered here would have been a treasured landmark in most other cities. 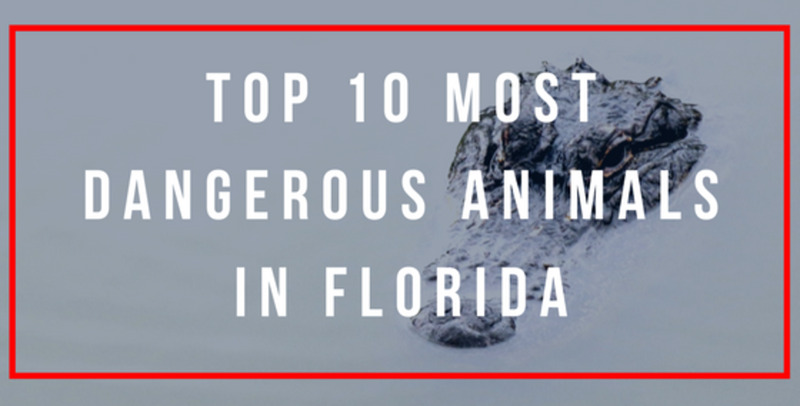 Sadly, only two are left, and one of the two is a fraction of its former size. The resurgence of train travel has made their architectural loss more bittersweet. Having lived in Chicago for a few years, I love this hub. Voted up and interesting. Excellent photographs. 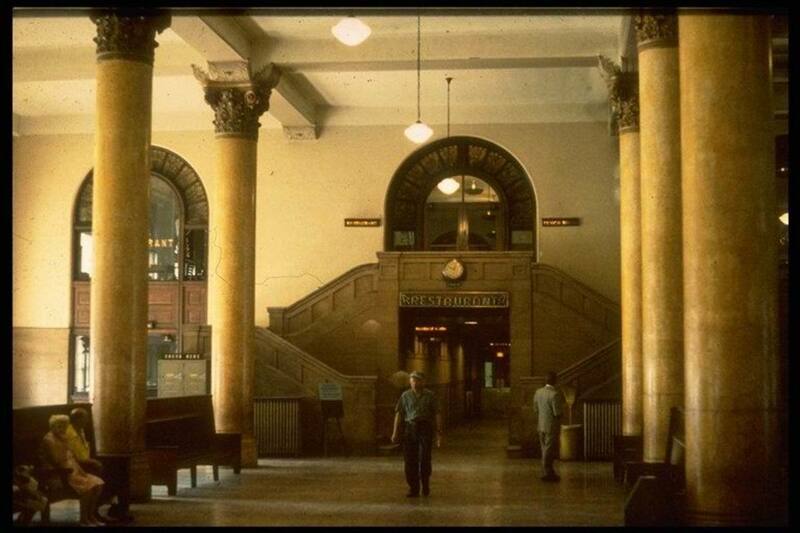 The one of Union Station in the 1950s reminds me of the iconic picture of the old Penn Station in NYC.